From covering news as it happens, to current affairs and political news, mobile journalism (Mojo) has become an essential skill for journalists. The mobile phone is no longer just a device to consume news but also device on which content is produced, edited and even broadcast. Journalist's have always written, taken pictures, edited, recorded audio and published content. And as smartphones cameras and processors have improved, more and more of that is possible to do to professional standards on a mobile phone. During a session on mobile journalism at the 10th Global Investigative Journalism Conference, Australian journalist Ivo Burum held two introductory sessions on how to do mobile journalism. He presented Guerrilla Mojo 101 and we share some of his guidelines. Mobile journalist and co-founder of Hashtag Our Stories, Yusuf Omar uses nothing but a phone when he produces mobile journalism content. “For me, its of the very essence, if you’re going to invest any money, invest it in the best mobile phone you can use and afford. That is the priority. Believe it or not I don’t use anything else. I don’t use a tripod. I don’t use a microphone. I get close to people and put my phone right close to their lips,” says Omar. Well, for the record, he also has a drone! Burum suggests a few more bits of kit: a tripod, clamp, shotgun (directional) microphone and an Airstash (a portable WiFi flashdrive). An advanced Mojo kit can also include a lens, lapel microphone, beast grip, gimble (a device to keep the phone steady when handheld) and radio mics. There are various mobile applications that can help in video and audio recording and editing. VONT (iOS) allows you to add text to videos. Its free on the App store. Video editing apps to consider are iMovie for iOS (free), Kinemaster for iOS or Android (free but needs subscription to lose watermark) and paid app Luma Fusion (iOS). 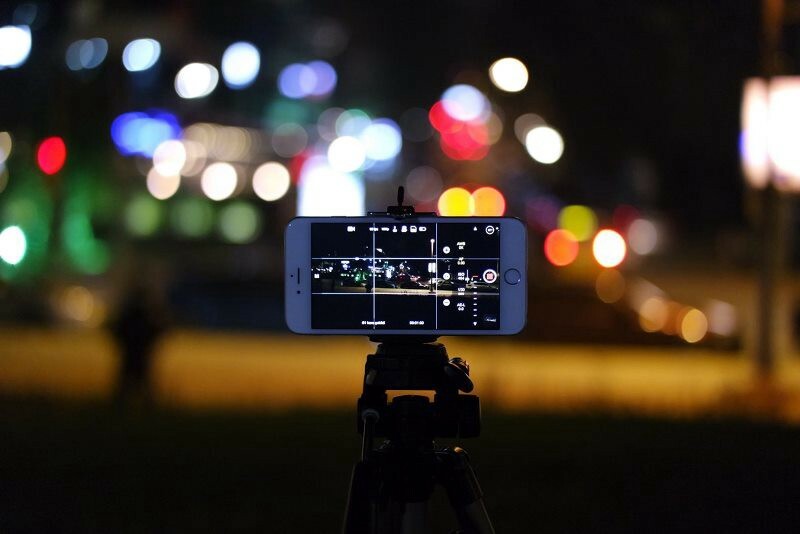 Other apps being used by journalists including Filmic Pro (iOS or Android) which gives you much more control of your phone’s camera, Ferrite (iOS) for audio recording and mixing and VideoGrade (iOS) for grading (colour correcting) video. ijNet recently reviewed 3 mobile video editing apps to try in 2018. Before you venture out into the field, you need to know what you will be recording. Like working on any other medium you have to pre-plan. Burum says journalists should plan ahead by making sure the phone is fully charged, and that there is a spare battery pack and enough memory on your phone. When you arrive on location, make sure to shoot with the light over your shoulder onto the subject. A small light can be used if it’s dark. Don’t forget to put your phone in flight mode while you record. You can use the phone as a microphone, but you’ll only get good sound if the mic is very close to the subject. Burum advises the reporter to get close and maybe use a separate mic for audio recording (Rode and others both make directional and lapel mics for mobile phones). The mic should be 6 to 8 inches from the interviewee’s mouth. When shooting, hold the a shot between seven to ten seconds (always a bit longer than you think you will need). You need to hold the phone steady if you are not using a tripod. This requires a bit of practice. You can edit your video on your phone (see the apps listed above) or you can download it onto a laptop and use imovie or FCP X for OSX, or Adobe premiere pro for Windows. Editing is a skill. Apple and Adobe have very good training videos available. There are a lot of resources online that can help journalists better their story telling through mobile journalism techniques. We’ve put together this list and welcome comments or reviews and other suggestions. The Global Investigative Journalism Network (GIJN) has a column about creating stories using mobile devices called Mojo Workin. GIJN have also published a series of tipsheets, presentations from previous Global Investigative Journalism Conferences here. Award-winning television, writer, director, executive producer with more than 30 years of experience, Burum runs a website, SmartMojo. Burum and Stephen Quinn published Mojo: The Mobile Journalism Handbook that introduces a set of multimedia skills and digital tools designed to make citizens, communications students and professional journalists more ready for a convergent change process that’s taking place in society. Want to stay up to date with the latest journalism and media innovation news from the African continent? Subscribe to our newsletter. The JAMLAB Newsletter is produced by Wits Journalism. The Journalism and Media Lab, Tshimologong Digitial Innovation Precinct, Johannesburg supports innovators to bring new information, new ideas and new conversations to new audiences in Africa.